2018 Fall NFC 14U KNIGHTS APPLICATION *- Application to play on the 14U Knights in the Fall. Please download, print and bring with you to the tryout. 2018 Fall Season Paper Registration Form *- Mail in Registration Form for the 2018 Fall season. Consent for Emergency Treatment- Consent for Emergency Treatment to be signed and brought to the first event the player attends. Fairfax County Youth Sports Scholarship Program Application Form *- Fairfax County Youth Sports Scholarship Program Application Form * - Fairfax County provides sports scholarships for children who live in Fairfax County and receive government assistance (e.g. free/reduced lunch, housing/child care/medical assistance). 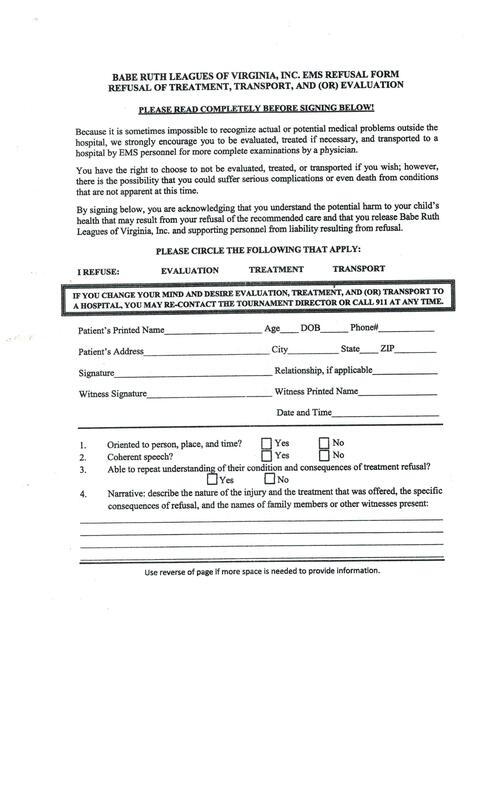 Access this document to find out who qualifies and to obtain the application form that needs to be submitted in addition to registering your player. NFC Babe Ruth Refund Policy *- Refunds will not be made for cancellations due to inclement weather, injuries, or other circumstances beyond our control. No refunds will be given after players are drafted or placed on teams. Pre-draft refund requests MUST be submitted in writing via email to: spavlecka@verizon.net. There is a $25 administrative fee for any refunds. Also, late fees are non-refundable. A $25 fee will be charged for any returned (bounced) checks.